Find out what makes this barrel racer the tough cowgirl that she is. The first impression one gets when meeting Sherry Cervi is that she’s pleasant, personable and conversationally engaging. The second is that she’s very tall. 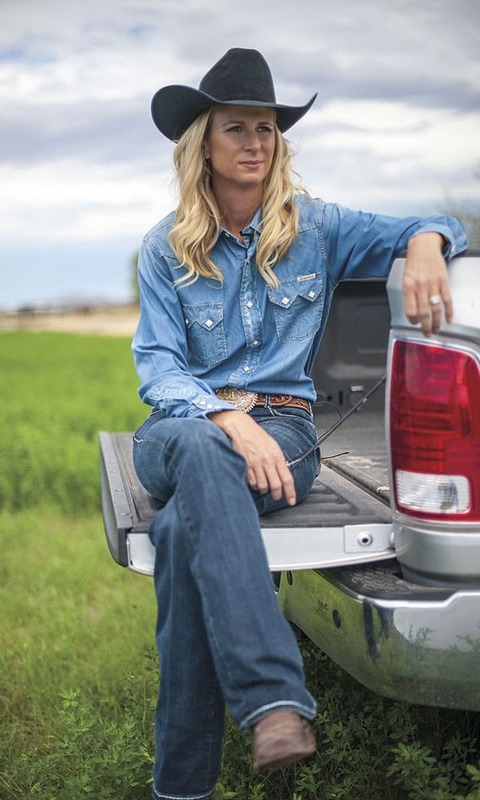 The statuesque blonde is not only a striking fixture in her well-appointed ranch home in the sprawling farming community of Marana, Arizona; she’s also a towering icon for girls and women across the West: one of professional rodeo’s most successful and accomplished barrel-racing athletes. With 19 qualifying trips to the National Finals Rodeo (NFR) and four world championship buckles, time seems to have little effect on her passion and ability to bring home the gold. Growing up around horses, Cervi found herself in the saddle at a very young age and, before long, found a passion for barrel racing that would take her from a pony-riding toddler to one of America’s most celebrated rodeo stars. Along the way, Cervi had the good fortune to bond with great horses. Steadfast rodeo fans will recognize the barn names; Dinero and Tinman at the beginning of her professional career, but it was Troubles that brought Cervi to her first NFR in 1994, and who led her to her first world title in 1995. A horse named Jet Royal Speed (AKA Hawk) however, sent the promising barrel-racing champion into high orbit. At the 1999 NFR Cervi rode Hawk in all 10 rounds, resulting in an astonishing year-end earnings total of $254,369. Cervi secured not only the NFR gold buckle and the WPRA world title, she also impressed the rodeo world by earning more at the finals than that year’s PRCA All-Around Cowboy, Fred Whitfield. Change was in the air in 2001 when Cervi rode Hawk at the NFR for the final time. Age was an issue for the 16-year-old gelding and he had reached the peak of his athletic career. It was also in 2001 that tragedy struck. The 25-year-old rodeo star lost her husband, Mike Cervi, who was killed in a private plane crash. Cervi returned to rodeo in 2003 atop MP Meter My Hay (Stingray) a palomino mare she raised from a foal. Although Cervi continued to qualify for the NFR in 2003, 2005 and 2006, she didn’t strike gold again until 2009, when she took the NFR average title aboard Stingray. 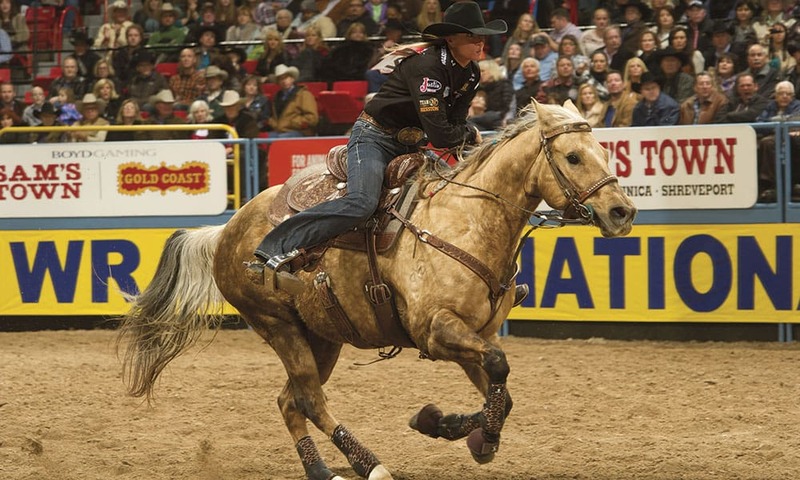 Cervi was back in 2010 and 2011, and struck gold again with the world title and NFR average in 2013. Sherry won three rounds and cashed a check in every single round—only the fifth time in PRCA history a barrel racer had accomplished that—and the first since Kristie Peterson back in 1997. Cowgirl Magazine sat down with Cervi at her Marana ranch to get a personal look into the mind and heart of one of America’s top barrel racers. CG: What advice can you offer someone who desires to become a successful barrel racer for the long haul? SC: For the long haul it’s going to take a lot of work and it’s definitely not going to be easy. Remember your goals and know there’s going to be big bumps in the road. You have to stay focused, keep trying and work hard. I truly believe if you work hard it will pay off in the end. CG: What was it like the first time you competed in front of tens of thousands of rodeo fans in the Thomas and Mack? SC: It was definitely a big adrenaline rush. You have to focus on what you are supposed to do and not worry about how many people are watching, but you can definitely hear the people in Las Vegas. CG: What makes a great barrel racer? SC: I think what makes a great barrel racer is a great horse. I would not be where I am in my career without great horses. You can be a good rider and a good competitor and have all the skills, but you have to have that horse to get you to that point. CG: What makes a great barrel horse? SC:I think your horse has to have a lot of heart. They’ve got to be able to compete under a lot of different circumstances. Rodeo doesn’t care about the weather; rain or shine they’re going to go on. [The horses] have to be able to handle the pressure, all types of ground, all different sizes of patterns and they’ve got to like their job. Those horses that got me gold buckles all had a lot of heart and loved their job. They had different styles, but knew their job, loved it and gave me 110 percent every time. CG: Which was your favorite horse? SC: It’s like picking your favorite kid. You just don’t do it. They all had their unique qualities that made them great. Stingray may be just a little more special because my mom and dad raised her. We stand her dad [PC Frenchmans Hayday] as a stud and I got to see her be born and go through all the stages to get her to this point, but I love all of them. CG: What is the singular achievement in your professional life that is most important to you? SC: I don’t know that it was my achievement, but in 2011 Stingray split the AQHA Horse of the Year and that is one of the most important awards. They gave it to me, but she won. It’s voted by your peers and your competitors and that’s very dear to me. CG: Who is your hero? SC: My parents. They are very influential in my career. They gave me the opportunity to do something that I dreamed about. They believed in me and still do. I feel very fortunate to have parents who supported me like they did when I was younger. (Originally published in the November 2014 issue of Cowgirl Magazine).